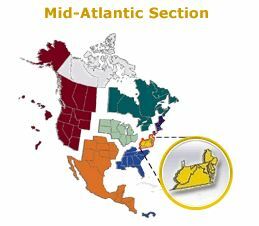 The Mid-Atlantic Section comprises the eastern portion of Pennsylvania, the southern portion of New Jersey, and the states of Delaware, Maryland, Virginia and West Virginia and the District of Columbia. The northwestern border of the Pennsylvania portion is a line previously described as the southeastern border of the Northeastern Section, starting from a point 42 degrees north and 75 degrees west near the Pennsylvania-New York state line and extending southwest to a point just north and west of the city of Harrisburg, including Wilkes-Barre, and then extending directly south to the Pennsylvania-Maryland state line at 77 degrees west. The northern border of the New Jersey portion is a line extending across the state of New Jersey at 40.5 degrees north, which is north of and including Trenton, from the coast to Pennsylvania-New Jersey state line. If you have any questions or concerns about the Section, please direct them to the President of the section, Dr. Michael Fabrizio, or the Secretary, Dr. Jay D. Raman. Sessions are held in intimate settings and afternoons are often free for leisure time. On the social side, the Section meeting features a Theme Reception and the President’s Reception and Banquet. The meeting is held within the section two out of every three years, and an established rotation places the Meeting at an enjoyable destination outside of the Section every three years. Access to the Section website and members only area to network with other members. Have a career related or practice question that needs an answer? Contact us. We are here to help you with any professional concerns you may have. As a member, you will have the opportunity to participate on the various Committees of the Section. Some members also choose to serve as Section representatives to the AUA. Participation on all levels builds leadership skills and members are encouraged to be involved. The Section provides awards for the annual Resident Research Prize presentations in basic and clinical science, and additional reimbursements are provided to resident programs to help offset travel costs to meetings. Membership in the AUA requires reciprocal membership in the Section for most categories. Please review the membership categories for additional information and requirements for membership. 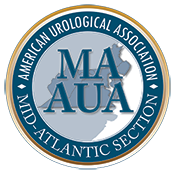 © Copyright 2018 Mid-Atlantic Section of the American Urological Association . All rights reserved.